Upon collision with a solid wall, a solid sphere will bounce, while a liquid drop will tend to splash. But what happens in between these two extremes? A few years ago, researchers from the National Autonomous University of Mexico investigated this ‘intermediate’ regime by observing the collision process of viscoelastic gelatin droplets on a glass wall using a high-speed camera. By varying the aqueous mixture of gelatin and the drop speed, a range of Weissenberg numbers were tested. The Weissenberg number (We) is a dimensionless number which compares the relative strength of the viscous and elastic forces; a low value of We represents a more solid-like collision, while a high value of We yields more liquid-like behaviour. 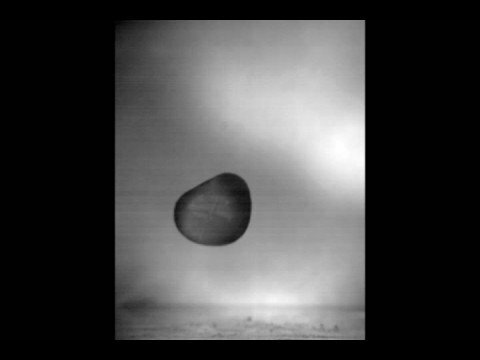 The results show the evolution from solid-like to liquid-like collisions: most interestingly, at very high We values, the drop splashes on impact, spreads into a thin sheet, then recoils and reforms into a (highly distorted) droplet.